Through ‘Empowering Berna’ project, “Merck More than a Mother” empowers infertile women socially and economically. “Merck More than a Mother” aims to improve access to information, education, healthcare and change of mind-set to break the stigma around infertility. Kampala, Uganda, February 27, 2017 – Merck, a leading science and technology company, today continues their commitment for the second year to empower infertile women in Uganda through improving access to information, health, change of mind-set and economic empowerment. Through “Empowering Berna”, Merck in partnership with Uganda Ministry of Health inaugurates today small businesses that been established this year to support infertile women across the country. Courtesy call on Uganda’s First Lady: From left to right: Hon. Sarah Opendi, Minister of State for Health, Uganda; Hon. Joyce Lay, Member of Parliament, Kenya; Dr. Belen Garijo, CEO, Merck Healthcare; H.E. Madame Brigitte Touadera, First Lady Central African Republic; H.E. Madam Janet Museveni, First Lady, Republic of Uganda; Dr. Rasha Kelej, Chief Social Officer, Merck Healthcare; Hon. VirginieBaiokua, Minister of Social Affairs and National Reconciliation, Central African Republic; Hon. Zuliatu Cooper, Deputy Minister of Health and Sanitation, Sierra Leone and Lina Ekomo, Central African Republic. The day’s program also included a courtesy visit to Uganda’s First Lady H.E. Janet Museveni at State House,Kampala by the Merck delegation to brief her on the “Merck More than a Mother” initiative and to explore possible areas of collaboration. The delegation consisted of H.E. Madame Brigitte Touadera, First Lady, Central African Republic; Sarah Opendi, Minister of State for Health, Uganda; Belen Garijo, CEO, Merck Healthcare; Virginie Baiokua, Minister of Social Affairs and National Reconciliation, Central African Republic; Zuliatu Cooper, Deputy Minister of Health and Sanitation, Sierra Leone; Joyce Lay, Member of Parliament, Kenya; Dr. Rasha Kelej, Chief Social Officer, Merck Healthcare; and Lina Ekomo, Central African Republic. From left to right: Dr. Anthony Mbonye, Director of Health Services, Ministry of Health, Uganda; Dr. Rasha Kelej, Chief Social Officer, Merck Healthcare; Hon. Sarah Opendi, Minister of State for Health, Uganda; H.E. Madame Brigitte Touadera, First Lady, Central African Republic; Hon. Zuliatu Cooper, Deputy Minister of Health and Sanitation, Sierra Leone and Hon. 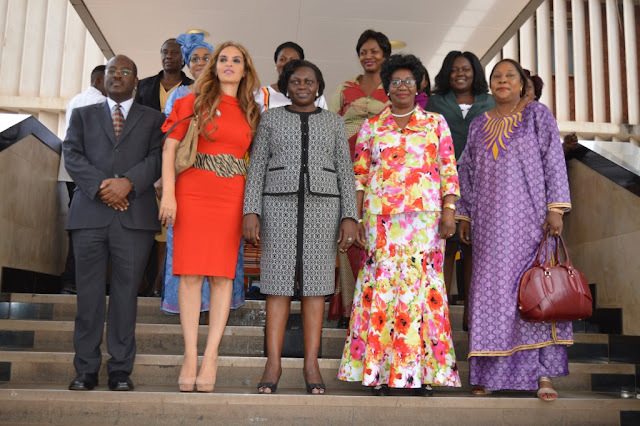 VirginieBaiokua (2nd row center), Minister of Social Affairs and National Reconciliation, Central African Republic. “In Africa including Uganda, infertile women still suffer discrimination, stigma and ostracism. More often an inability to have a child or to become pregnant results in the woman being greatly isolated, disinherited or assaulted. This sometimes also results in divorce or physical and psychological violence. I am glad to see an initiative that addresses this challenge in the public domain in Africa as it is something that no one talks about and is treated as secret. “Merck More than a Mother” is therefore very important for Africa since it aims to define interventions to reduce the stigma and social suffering of infertile women across the continent,” said, Sarah Opendi, Minister of State of Health, Uganda. Dignitaries meeting before the “Merck More than a Mother” event in Kampala, Uganda: Left to right – Dr. Belen Garijo, CEO, Merck Healthcare; H.E. Madame Brigitte Touadera, First Lady, Central African Republic; Hon. Sarah Opendi, Minister of State for Health, Uganda; Dr. Rasha Kelej, Chief Social Officer, Merck Healthcare; Hon. Joyce Lay, Member of Parliament, Kenya; Prof. Joe Leigh Simpson, Past President, International Federation of Fertility Societies; Prof.OladapoAshiru, President, Africa Fertility Society; and Dr. James Olobo-Lalobo, Vice President, Africa Fertility Society. Brian and Sawuiya Ntongo (2nd right) a couple from Uganda shares their experience with infertility and how they overcome it together through a shared responsibility as Hon. Sarah Opendi, Minister of State for Health, Uganda; Hon. Joyce Lay, Member of Parliament, Kenya; Dr. Belen Garijo, CEO, Merck Healthcare and Dr. Rasha Kelej, Chief Social Officer, Merck Healthcare look on and admire the baby born after both of them sought fertility care as a couple. According to the World Health Organization(WHO), lower levels of development are thought to be associated with higher levels of non-genetic and preventable causes of infertility such as poor nutrition, untreated sexually transmitted infections (STIs), unsafe abortion, consequence of infections caused by the practice of female genital mutilation, exposure to smoking and to leaded petrol and other environmental pollutants. Hence prevention awareness is very important,” Sarah Opendi added. H.E. Madame Brigitte Touadera, First Lady Central African Republic and Hon. 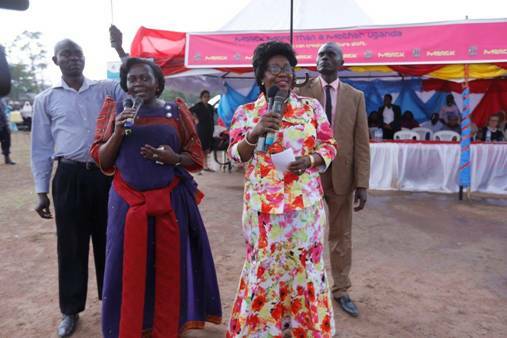 Sarah Opendi, Minister of State for Health, Uganda address participants in Tororo, Uganda during the inauguration of businesses for infertile women established with support from “Merck More than a Mother’s” ‘Empowering Berna’ Project. “The businesses established by “Empowering Berna” project are benefitting over800women in many districts in Ugandawho have come together in groups and have been trained and supported to establish bakery, catering and tent hire businesses and more. They are currently able to earn an income to support themselves from their own new businesses – they are now ‘more than mothers,’” Rasha Kelej added. Right to left: Dr. Rasha Kelej, Chief Social Officer, Merck Healthcare; H.E. Madame Brigitte Touadera, First Lady, Central African Republic; Dr. Belen Garijo, CEO, Merck Healthcare and Hon. 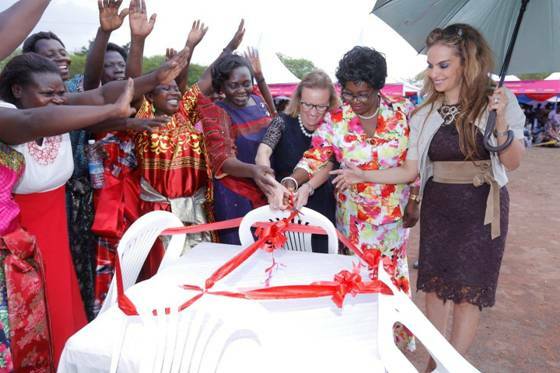 Sarah Opendi, Minister of State for Health, Uganda cut a ribbon to signify the inauguration of the chairs, tables and tent hire business established for one of infertile women’s group in Tororo, Uganda through “Merck More than a Mother’s” ‘Empowering Berna’ Project. Over 1,000 infertile women in Kenya, Uganda, Nigeria, Ghana, Tanzania,CAR, Ethiopia, Liberiaand Cote D’Ivoire who can no longer be treated have been empowered socially and economically to lead independent and happier lives through “Empowering Berna”. 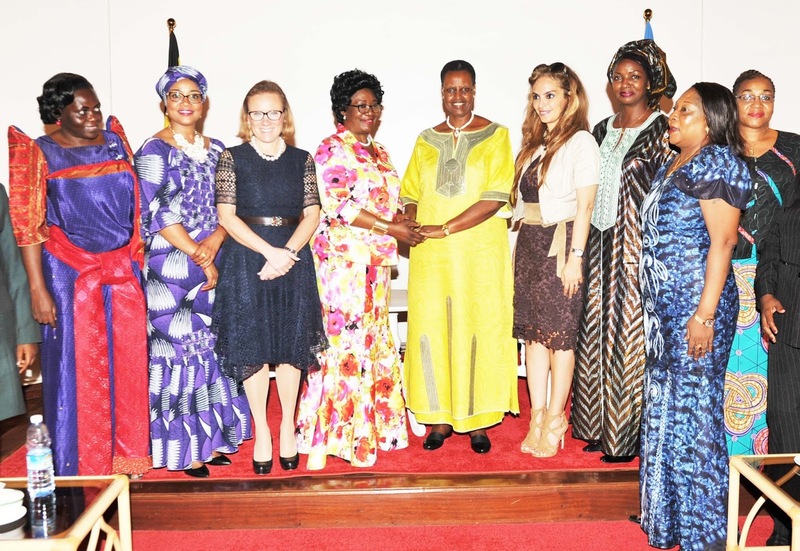 The event in Uganda was attended by policy makers including ministers and fertility experts and included: Sarah Opendi, Minister of State of Health, Uganda;Zuliatu Cooper, Deputy Minister of Health and Sanitation, Sierra Leone; VirginieBaikoua, Minister of Social Affairs and National Reconciliation, CAR; Joyce Lay, Member of Parliament, Kenya; OladapoAshiru, President of Africa Fertility Society; Joe Simpson, Past President, International Federation of Fertility Societies; Paul Le Roux, President of Southern African Society of Reproductive Medicine and Gynaecological Endoscopy; Kamini Rao, Chair International Institute for Training &Research in Reproductive Health, India; and Mohamed Kamal, President of Future Assured Foundation, Nigeria. Maria Nabaggala, a researcher at Infectious Diseases Institute, Uganda, the 4th place winner, of 2016 UNESCO-Merck Africa Research Summit ‘Best African Women Researcher Award’ is awarded at home by Dr. Belen Garijo, CEO Merck Healthcare; and Hon. Sarah Opendi, Minister of State of Health, Uganda as Dr. Rasha Kelej, Chief Social Officer, Merck Healthcare looks on. The 2016 UNESCO-Merck Africa Research Summit was held in Addis Ababa, Ethiopia, where Maria was first awarded. Dr. Rasha Kelej, Chief Social Officer, Merck Healthcare, engages with religious leaders in Tororo, Uganda on how they can support the fight against the stigmatization and discrimination of infertile women in their communities. 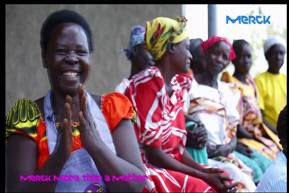 Watch videos below of Ugandan women who are infertile and have been supported to start their own businesses through “Merck More than a Mother’s” Empowering Berna Project. 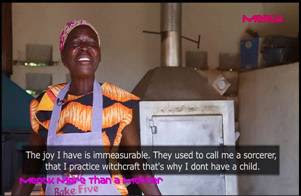 Watch below the video of a Ugandan couple Byansi and Sawuyaand their battle with infertility and how they sought fertility care together and got a baby. About Merck Capacity Advancement Program- Merck CAP The Merck Capacity Advancement Program (CAP) is a ten-year program aiming to expand professional capacity in developing countries in the areas of research and development, advocacy building, supply-chain integrity and efficiency, pharmacovigilance, medical education, and community awareness. It was established in 2012. Merck CAP signature initiatives include the following:Merck Universities Program, Merck Diabetes and Hypertension Awards, Merck Cancer Access Program, Merck More than a Mother and “Merck STEM Program for Girls and Women”. Create a culture shift to de-stigmatize infertility and to build respect and understanding around infertile women in Africa. Raise awareness about infertility prevention management and male infertility by integrating the topics into existing healthcare infrastructure, such as HIV, maternal health, and mother and child programs. Education and training for African embryologists to build the needed capacity. Supporting policy makers to define artificial reproductive therapy (ART) policies to improve access to regulated fertility care. Building advocacy and open dialogue and working closely with governments, policy makers, parliaments, healthcare providers, fertility experts and the media to define interventions that will reduce social suffering and improve access to regulated, effective and safe fertility care in Africa. Empowering infertile women socially and economically through access to education and healthcare, and by changing mind-sets. For example, empowering women who cannot be treated by helping them to start a small business through the “Empowering Berna”project. The first Medical Oncology Fellowship Program for Sub-Saharan Africa held at the University of Nairobi, Kenya and at Tata Memorial Centre in India,with the aim to increase the limited number of qualified oncologists in the continent. In partnership with cancer patients’ organizations across Africa, this will support women cancer survivors to establish small businesses in order to re-build their independent lives and become productive members of society. About Merck Universities Program The program provides European accredited diabetes and hypertension management for medical undergraduates and postgraduates from African universities. It enables them to become diabetes and hypertension ambassadors across the continent, especially in rural areas. More than 17,000 medical students from Angola, Ethiopia, Ghana, Kenya, Mozambique, Namibia, Tanzania and Uganda have benefited from this program and we aim to reach 25,000 by 2018. Merck launched the “Merck Diabetes Award” and the “Merck Hypertension Award” in March 2016 as part of the Merck Capacity Advancement Program for Africa and Asia with the aim to build a platform of diabetes and hypertension experts across the globe. Through its annual platform UNESCO Merck Africa Research Summit, the Merck STEM program aims to empower young and women African researchers in order to prepare for the road ahead in Africa’s development as an international hub for research excellence and scientific innovation. 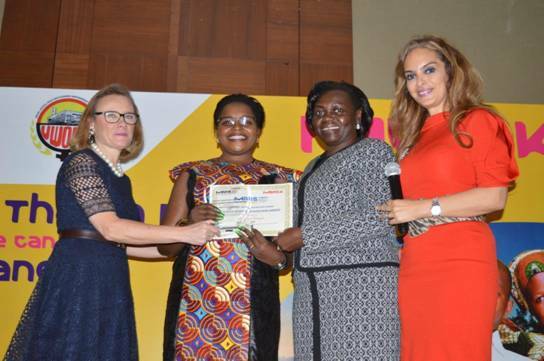 Furthermore Merck has launched for the first time, “MARS best African Women Researcher Award” to empower women in the fields of Research and healthcare. Please visit www.unesco-mars.com for more information. To read more about Merck Capacity Advancement Program initiatives in Africa, visit www.merck-cap.com and www.merck-africa.com. About Merck Merck is a leading science and technology company in healthcare, life science and performance materials. Around 50,000 employees work to further develop technologies that improve and enhance life – from biopharmaceutical therapies to treat cancer or multiple sclerosis, cutting-edge systems for scientific research and production, to liquid crystals for smartphones and LCD televisions. In 2015, Merck generated sales of € 12.85 billion in 66 countries.